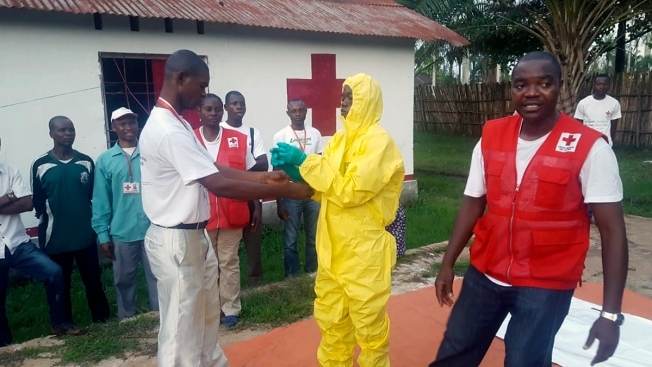 In this photo taken Monday, May 14, 2018, members of a Red Cross team don protective clothing before heading out to look for suspected victims of Ebola, in Mbandaka, Congo. Congo's Ebola outbreak has spread to Mbandaka, a crossroads city of more than 1 million people, in a troubling turn that marks one of the few times the vast, impoverished country has encountered the lethal virus in an urban area. "The vaccination campaign begins tomorrow, Monday, in Mbandaka, capital of the province. It will target, first, the health staff, the contacts of the sick and the contacts of the contacts," Minister of Health Oly Ilunga told The Associated Press Sunday. The WHO appears to be moving swiftly to contain this latest epidemic, experts said. The health organization was accused of bungling its response to the earlier West Africa outbreak —the biggest Ebola outbreak in history which resulted in more than 11,000 deaths.